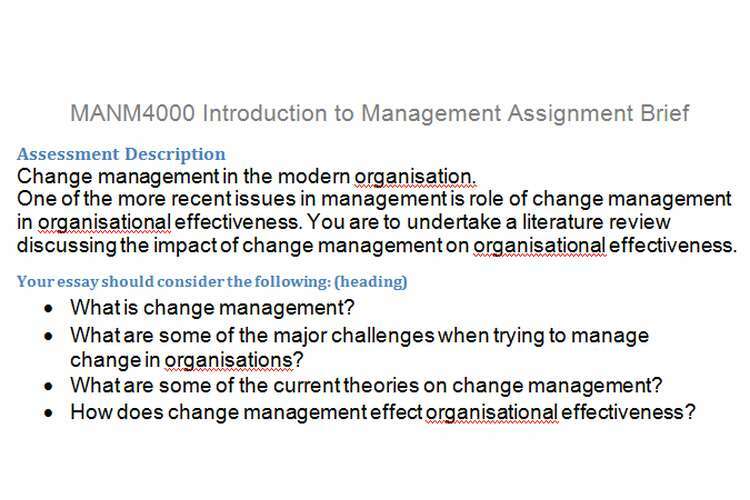 This MANM4000 introduction to management assignment brief we discuss theories on change management, effects of organizational management, research and treatment of the contemporary literature and use of the Harvard Referencing System. Change management in the modern organisation. One of the more recent issues in management is role of change management in organisational effectiveness. You are to undertake a literature review discussing the impact of change management on organisational effectiveness. What are some of the major challenges when trying to manage change in organisations? What are some of the current theories on change management? How does change management effect organisational effectiveness? How the current change management theories be applied to support organisations? What examples from recent media can you provide to support your discussion? The incorporation of organisational examples as illustrative evidence. A display of critical evaluation and diagnostic skills in the choice of the data included. A display of critical evaluation in the choice of the information sources used. No more than 1 reference may be general Internet based sources. Wikipedia is not to be used and does not count as an academic reference.